Good badger, Bad Badger. In literature, the badger falls into either one of these two camps. “Good badger” like Kenneth Grahame’s Mr Badger and, “bad Badger” like Beatrix Potter’s Tommy Brock, the rabbit kidnapper in, “The tale of Mr Todd”. However the good/bad badger portrayal is relatively recent, only really becoming apparent in the 20th century. Stories about badgers stretch right back to the 11th century, an Anglo-Saxon poem from this time, shows a noble creature defending its family from attack. Storey tellers have placed human characteristics upon badgers that have come to inform our overall perception of the animal. They are wise, courageous and persistent? Also because they are nocturnal, they are seen as mysterious. This nocturnal aspect of their nature has in turn had an influence of their portrayal in literature, badgers are often, alone, grumpy or gruff! 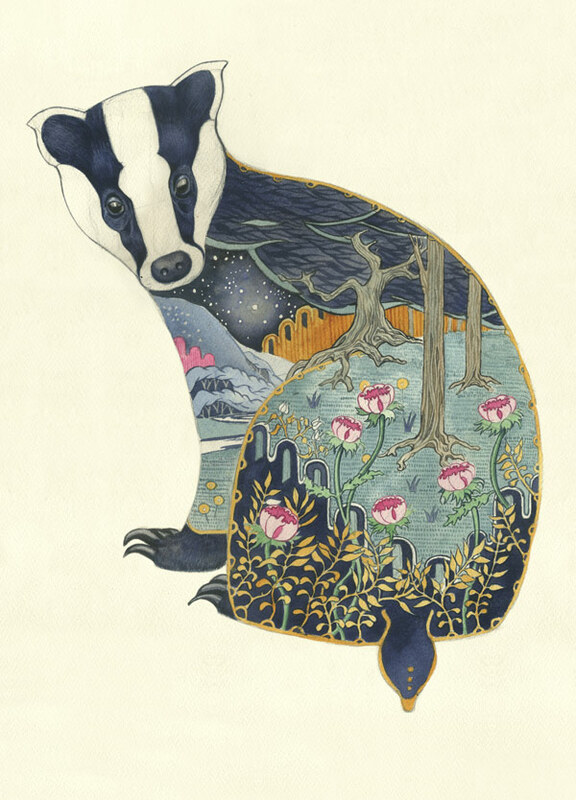 In European folklore the badger character is intimately associated with the bear and is considered a forecaster of the arrival of spring, as populations of bears in Europe dwindled the badgers significance in folklore increased. This entry was posted in animals and tagged bad Badger, Badger, european folklore, Good badger, Mr Badger. Bookmark the permalink. Looove the colours and designs in this – beautiful!